Multiple sport activities might also often mean multiple injuries as well. The most common sport injuries are those of ‘soft tissue’ that include muscles, tendons, ligaments and joint cartilage. Injuries are sometimes a cause of bad assessment, bad practice techniques, inadequate equipment, poor physical readiness or lack of stretching practices after training practices. Acute sport injuries often include muscles strains, joint dislocations and tendon or ligament injuries. Chronic injuries lead to cartilage and tendon damage due to overuse. What is in common or all injuries is the order in which they appear: mechanical injury, inflammation, swelling, pain and redness, lack of mobility and impaired function of the injured body part. For the most part, acute and chronic sport injuries can easily be controlled and solved. ZGLOBEX® spray acts as a very effective analgesic that leads to symptom relief upon its application. The effect of ZGLOBEX® spray is mostly symptomatic. However, if applied within few hours from injury, ZGLOBEX® spray limits swelling and pain, and the injury itself to the minimal point. 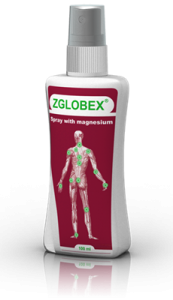 ZGLOBEX® spray with magnesium helps alleviate pain and spasm in muscles, reduces inflammation processes and rheumatic pains, and improves state of painful joints. Improvement can be seen and felt within 5 minutes of application. Acts locally. Ideal for sport injuries. ZGLOBEX® spray has analgesic and anti-rheumatic action due to extracts of clove and pine. Acts as an inhibitor of inflammation mediator production. Allows for an intensive cooling sensation after application onto painful or swelled body surfaces. Cryotherapy has been recognized by physiotherapists, sport doctors and other healthcare practitioners. It can be applied to all body parts with undamaged skin layer- ankle, knee, elbow, hand joints as well as muscles. Two to four times a day spray or rub onto sore or inflamed spot. Spray is not intended for use on damaged skin.